To receive a royal pardon in sixteenth-century France for certain kinds of homicide—unpremeditated, unintended, in self-defense, or otherwise excusable—a supplicant had to tell the king a story. These stories took the form of letters of remission, documents narrated to royal notaries by admitted offenders who, in effect, stated their case for pardon to the king. Thousands of such stories are found in French archives, providing precious evidence of the narrative skills and interpretive schemes of peasants and artisans as well as the well-born. 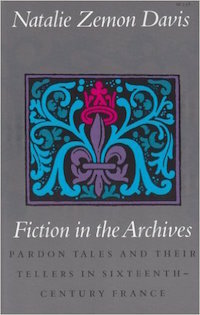 This book, by one of the most acclaimed historians of our time, is a pioneering effort to us the tools of literary analysis to interpret archival texts: to show how people from different stations in life shaped the events of a crime into a story, and to compare their stories with those told by Renaissance authors not intended to judge the truth or falsity of the pardon narratives, but rather to refer to the techniques for crafting stories. A number of fascinating crime stories, often possessing Rabelaisian humor, are told in the course of the book, which consists of three long chapters. These chapters explore the French law of homicide, depictions of "hot anger" and self-defense, and the distinctive characteristics of women's stories of bloodshed. The book is illustrated with seven contemporary woodcuts and a facsimile of a letter of remission, with appendixes providing several other original documents. This volume is based on the Harry Camp Memorial Lectures given at Stanford University in 1986.